Recent studies showed that the color red tends increase our attraction toward others, feelings of jealousy, and even reaction times. Now, new research shows that female monkeys also respond to the color red, suggesting that biology, rather than our culture, may play the fundamental role in our “red” reactions. “Previous research shows that the color red in a mating context makes people more attractive, and in the fighting context makes people seem more threatening and angry,” explained Benjamin Y. Hayden, a coauthor of the study and professor in brain and cognitive sciences at the University of Rochester. Hayden, whose research often involves primates, and Andrew J. Elliot, a professor of psychology at Rochester who has published several articles on humans and the red effect and coauthor of the study, sought to uncover what causes humans’ response to the color. Is it triggered simply by repeated cultural exposures, or is there a biological basis that may help explain why the color tends to amplify human emotions? 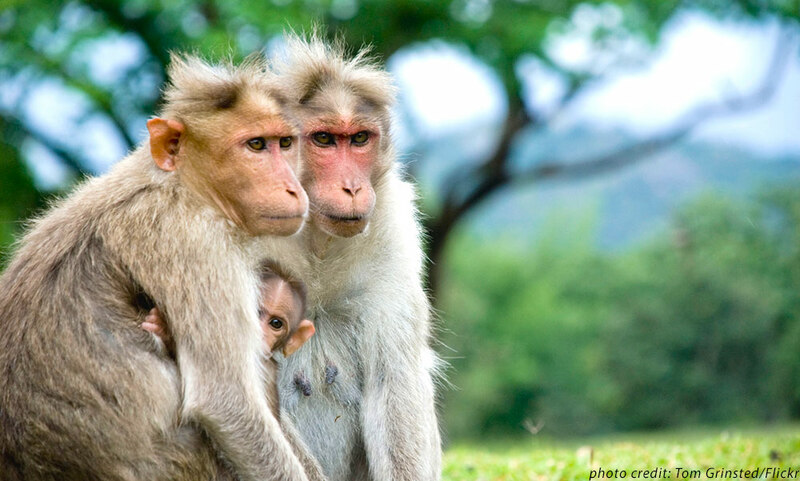 The new study, which appears in the journal Evolution and Human Behavior, involved rhesus monkeys (Macaca mulatta) from a free-ranging population of approximately 1000 residing at the Cayo Santiago field site in Puerto Rico. The animals live in naturally formed social groups and are habituated to human observation. The researchers conducted two trials that measured the amount of time the primates looked at black and white images of the hindquarters of adult monkeys. The stimuli, which included images of both sexes, were surrounded by an “extraneous” color, framed by either red or blue. The researchers also used an image of a common shell found on the island as a control data point. Hayden noted that a standard measure to gauge interest in those who don’t have language—primates or babies, for example—is by how long they look at a given object. The longer the gaze indicates a greater amount of interest. In the first trial, the researchers displayed sequential images of male hindquarters surrounded—in random order—by frames of red or blue, to adult monkeys of both sexes. They were also presented with the shell image. In a second trial, the researchers displayed images of female hindquarters surrounded, again by either a red or blue frame. Female monkeys did not show a preference for other female hindquarters, regardless of the color of the surrounding frame. But, surprising to the researchers, male monkeys did not show a preference for the female hindquarters, either, even when surrounded by the color red. The researchers say additional work is needed to understand why males did not respond to the extraneous colors. One possibility is that the reproductive state of females is reflected in facial color changes rather than changes in the hindquarters. Images of females, which were restricted to the hindquarter region, may have been too limited to elicit male responses. Neither males nor females displayed a bias toward the shell image regardless of the color of its frame. Kelly D. Hughes, a doctoral candidate at the University of Rochester, was lead author of the study. James P. Higham, an assistant professor of anthropology at New York University, and William L. Allen, a post-doctoral fellow in anthropology at the University of Hull, are coauthors. The Sloan Foundation, NIDA, and two Reach fellowships from the University of Rochester to undergraduate research assistants supported the work. The population of rhesus monkeys at Cayo Santiago is currently supported by the National Center for Research Resources, the Office of Research Infrastructure Programs of the National Institute of Health, and the Medical Science Campus of the University of Puerto Rico.